ONE BUCK BOOK: Have You Felt Like Giving Up Lately? Everyone experiences times of sadness, trials, and pain. But what happens when grief and depression seem so overwhelming that we feel like giving up? As the founder of World Challenge, Inc., David Wilkerson worked with troubled people of every type: students, parents, alcoholics, delinquents, businessmen, pastors, teachers, and drug addicts. In this hopeful and encouraging book, Wilkerson examines the universal problem of discouragement. He shows readers how to let God heal their wounds, restore their faith, and give them genuine, lasting peace. Only God can conquer your hurts. With powerful true stories and wisdom gleaned from a lifetime of service, Wilkerson gently guides you to the point of giving it over to God and believing that He will work miracles in your life. 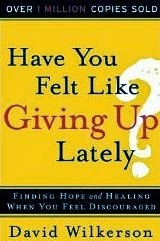 I purchased the book, for the simple fact that I did feel like giving up. I brought it home thumbed through it, then put it down; thinking to myself another book about God and I won't read it. Needless to say I began at page one, and went through the entire book. I could not believe the information that the author put in the pages hit home to the reality that God really loves you and is right there waiting to pick you back up now that your down. My recommendation, if you are distressed with life and feeling that God cannot love you because of sin in your life then this book is for you. Take Care.